Mountain Weather: Where is All the Snow? Usually by around Halloween skiers start thinking more about winter than they are about fall sports. If you remember last year at this time the Northern Rockies were already blanketed with 2 to 3 feet of snow between October 23 & 26, 2010 and people were backcountry skiing like it was early December. Yesterday I took a mountain bike ride (while thinking about skiing!) with Chris Harder who told me he had skied “25-short” in Grand Teton National Park, to the valley floor, on October 28, 2010. What a difference a year makes. Also, parts of the Northeastern U.S. have already had some pre-Halloween snowfall, from the Catskills of New York to the mountains of Vermont and New Hampshire (pronounced “New Hampsha”). They got good snow this past week also, albeit less than 10 inches in most places. The other area that was getting heavy snowfall this week was the mountains of British Columbia and into the Canadian Rockies. Some skiers in the U.S. Northern Rockies might already be saying where’s ours? With all the hype about it being another “La Nina Winter” I think people expect a repeat of 2010-11. 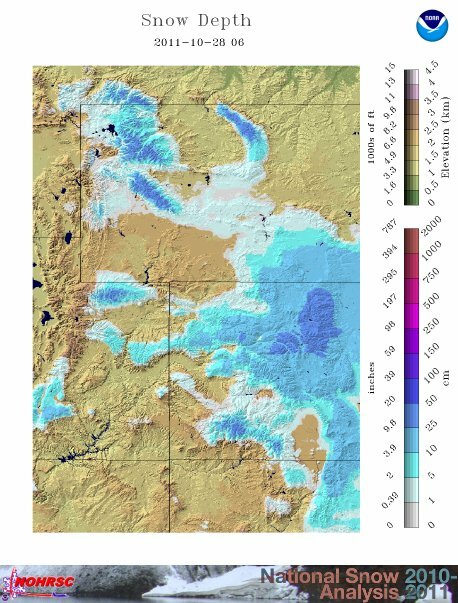 And while we may end up with an above normal snowfall winter again in Jackson Hole, the distribution of that snowfall may not necessarily be identical to last year, nor as continuous like it was from late October to late May!!. It’s already different than it was last year going into this winter. Keep in mind as we go through the next 6 months, that no two La Nina’s are created equal. 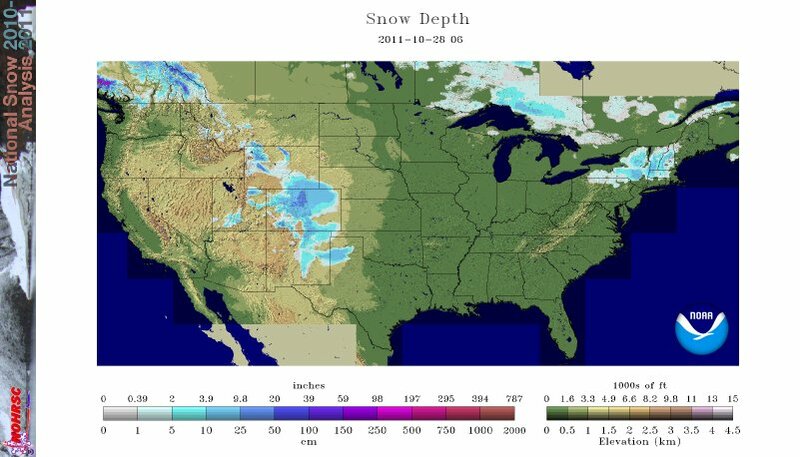 If you are planning ski trips this winter you can keep track of where the snow is, across the entire USA and southern Canada by going to www.mountainweather.com and getting on the Skier’s Page under the "Additional Mountain Weather" drop-down menu. Here you will find links to ski areas throughout the US, with a concentration of links and more information for western U.S. ski areas. Also links to the latest Avalanche Advisories are midway down the page, for the backcountry skier. At the bottom of the page is where you’ll find snowfall and snowdepth info in more detail. (An example of the National Snow Depth map is shown below). There is also a link in the Quicklinks box in the upper right hand corner of the Skier’s Page that will take you to the National Snow Analyses page that is updated daily by NOAA. If you are a real snow-nerd, you can keep up with everything from snow depths, to snow-water equivalent, to sublimation throughout the early season and over the course of this winter. Blog looking good woody. Thanks for the intel. instrument to measure wind speed & meters a weather station need many portable wind meter to collect date from many different places, If the gadgets are not give you accurate reading then accurate weather reporting is not possible. So you should purchase them from a reputed weather stationery shop.